Two-piece Merkel seal set for use as a primary rod seal. 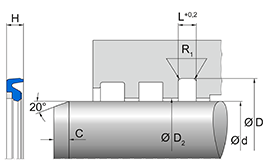 The Merkel Syprim SM seal set is always used in a sealing system in combination with U-ring (e.g. Merkel U-Ring T 20). 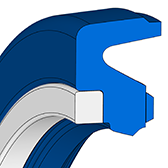 The Merkel U-Ring Syprim SM is designed especially for use as a system seal.